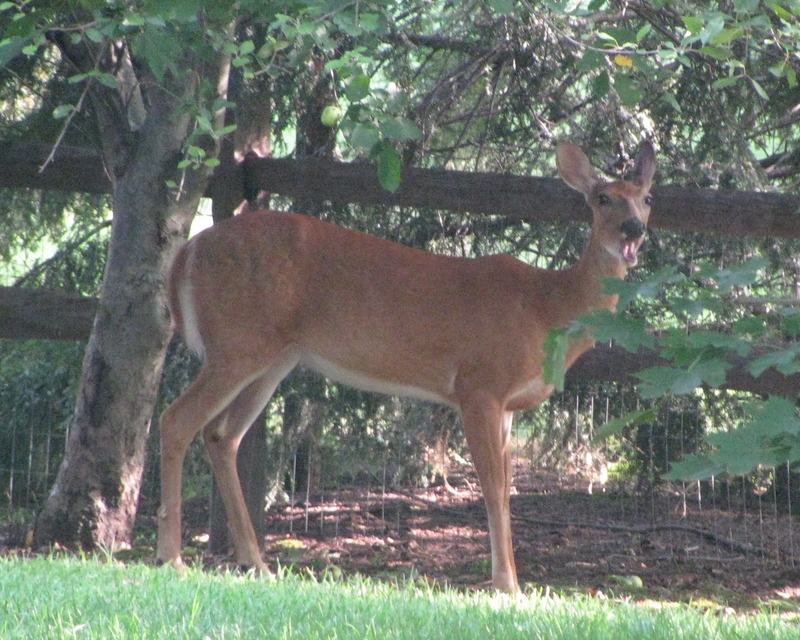 This morning, a deer decided to take a leisurely breakfast near our two apple trees. Vultures caught us by surprise, though. Clay, our resident animal whisperer, was not worried. “Should we be afraid of them?” my wife asked at the time on the keyboard Clay uses to communicate. “No so silly they are docile,” he responded. So we decided to wait and see. 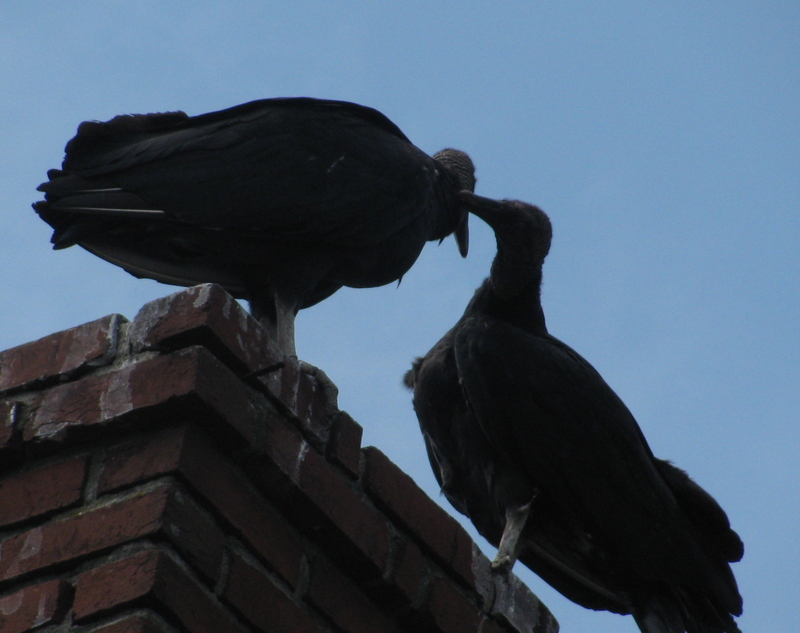 (Not that the vultures were asking for permission.) 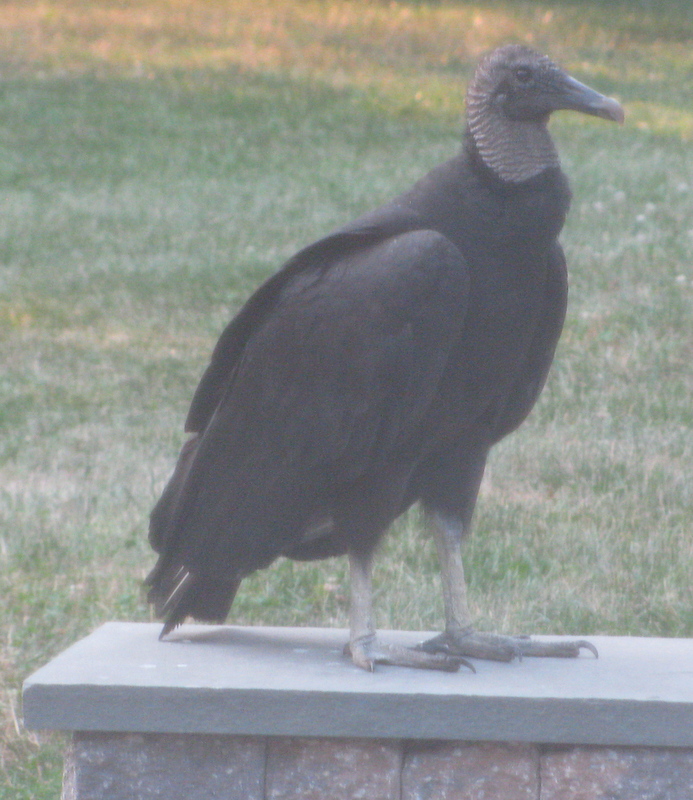 Turns out there was just one turkey vulture (you can tell from the red face), and he or she moved some place else. 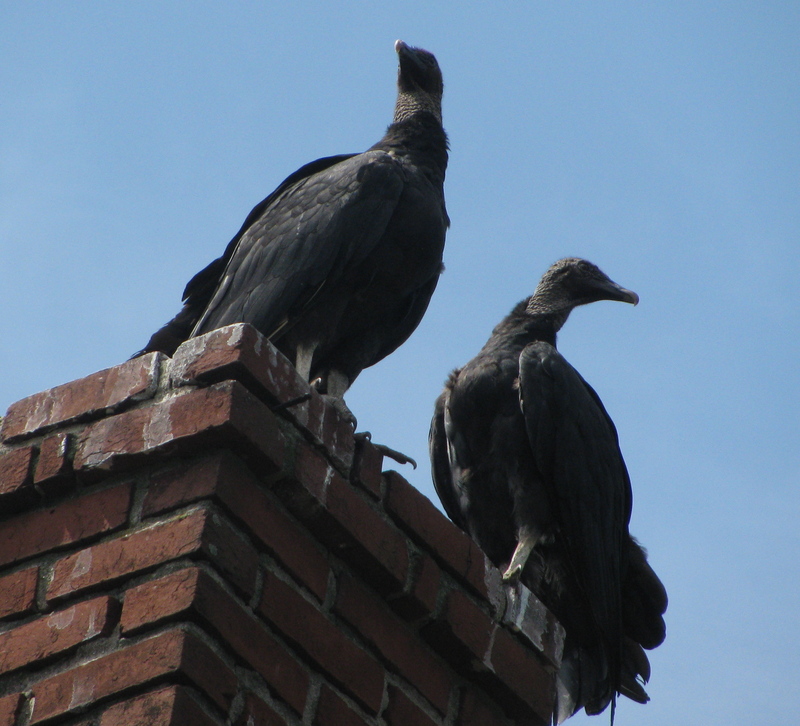 As best we can tell, two black vultures remained and seem to be making themselves at home. We’ll occasionally find one or both on our patio, though not when we are out there. I took this picture through the back door. Sometimes, one will sit on the peak of the garage, surveying the backyard. I know they are only preparing to head off to hunt, and they only eat dead animals. But I’m still not ready to sit on the lawn eating a chicken sandwich. Saturday morning, we were enjoying some cooler weather on the patio when we heard the familiar helicopter whooshing and watched both birds land on our chimney. They hung out for awhile, pecking at each other, making the wind-tunnel noise they make, seemingly unworried about us sitting nearby. Later, when I went for a walk, I saw them from a few blocks away, circling high above our house. 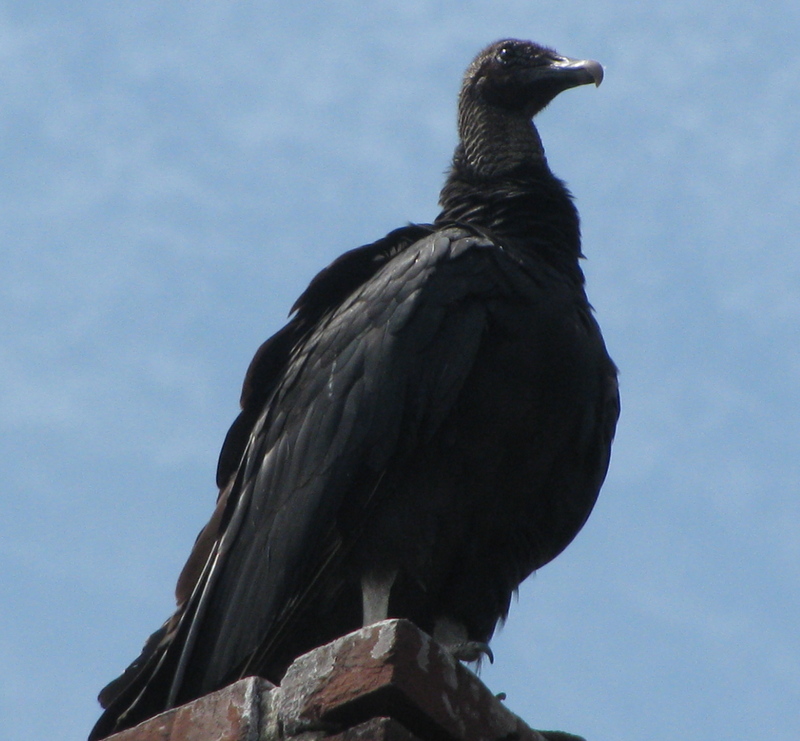 We’ve been awaiting the appearance of some baby vultures over the past month, but so far no luck. If there are chicks, they have not left the loft, yet. (Or, they’ve grown so fast, we can’t tell the difference between the babies and the adults.) I’ve considered donning catcher’s gear with a trash can lid as a shield and taking a peek in the loft. But that doesn’t seem all that smart, even if Mom and Dad are off hunting. Maybe some vulture chicks will appear soon. Or maybe we’ve already met them. Either way, I find myself looking for our summer tenants when I leave the house. Are they on the chimney? In the backyard? Soaring above the house? Yes, they have razor-sharp talons and beaks specially designed to rip meat off carcasses. But they are starting to feel like old friends. Clay was right all along. As my wise wife points out, again and again and in so many ways, the little guy teaches us not to pass judgement until you have cracked the cover and taken a good look at the book inside. This entry was posted on August 8, 2011, 9:46 am and is filed under Communicating, Daily Life. You can follow any responses to this entry through RSS 2.0. You can leave a response, or trackback from your own site. Crazy! They look quite intimidating. Thanks for showing pictures. Our guests are a few foxes that set up permanent residence two houses to the north of us. The lady (we call “Fox Lady”) feeds them, so they’re the size of our dog. As I was in our vegetable garden yesterday, I was overwhelmed by the awful smell of their poo. Don’t know how they got into our fenced in garden with Maldini to protect us, but they did. 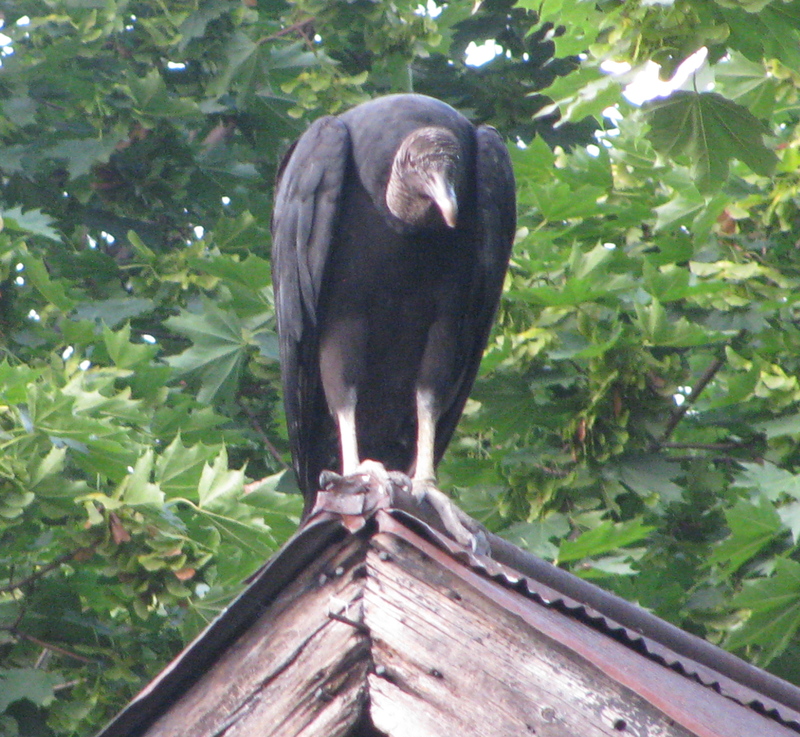 Maybe you could send one of your vultures to take care of them??? Those are some scary looking animals. I think they’re better than guard dogs! I have to admit my heart starts pounding when I hear them, huge wings spread out, flying across our lawn like a formation of helicopters. But they have been pretty good tenants, so far. Of course, they are late with their rent payments, but I don’t think I’m going to push the matter. I feel the same way as Larry. I didn’t see William and Kate (named by our older son) for over a week and was afraid that they might have flown the coop. I was so excited to see the sky darken temporarily, knowing that one was flying to the chimney.